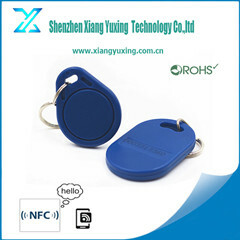 RFID ear tag for cow - Shenzhen XiangYuXiang Technology Co.,Ltd. The RFID ear tag is made from eco-friendly material that is nontoxic, no special smell and pollution free. RFID ear tag is widely used for animal tracking and identity management, to realize the animal information management like effective tracking and traceablity, epidemic prevention and control, meat inspection, etc.